2018 EHF Men’s EURO Championship in Croatia – i.s.t.a.a. Ban Tours is an expert with big events and has, among other, been the official travel agency for the 2009. 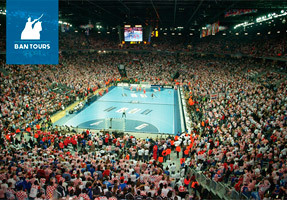 World IHF Men’s Handball Championship with a total of more than 3.500 tournament travelers which included 7 host cities, 24 sport teams, sponsors, VIPs, fans & press officials. The company also handles most of football related travels & events in Croatia being the current official travel agency of Croatian Football Federation, GNK Dinamo, HNK Rijeka & NK Lokomotiva football clubs as well as numerous realized land services for top international football clubs and national teams. Keep an eye on the tournament draw & save the date > 23.06.2017. when everyone will know in which city the participating teams will start playing the 2018 Men’s EHF European Championship in Croatia.